It's 1967, and Holling Hoodhood has a lot to deal with. He is constantly fielding bullies at school, his sister wants to be a flower child, his dad is completely focused on his job as a highly regarded architect and ignores his family's true needs, and he thinks his teacher, Mrs. Baker, hates his guts. Holling, being the only Presbyterian in his class, is the only student who doesn't have to go to Hebrew school or Catechism on Wednesday afternoons. As a result, Mrs. Baker has to stay in class with him. Though they start off with Holling clapping erasers, eventually they move on to Shakespeare plays. Throughout the year, Holling learns to apply Shakespeare to life, under Mrs. Baker's guidance—all against the backdrop of the Vietnam War. The Wednesday Wars is everything I want in historical fiction. I'm not into the romance stories or melodramas that seem to be pretty popular. I'm all about how realistic people react to being in a certain time period, especially if it's done with humor. And for some reason I love reading about the 1960s. What I really loved about Schmidt's writing was how he managed to get very deep and meaningful messages into Holling's often sarcastic and wry musings and observations. It's the voice of a middle schooler with the wisdom of Mrs. Baker, a military wife and teacher. Characters really developed over the course of the novel. We see hidden sides of most characters, especially Mrs. Baker; Mrs. Bigio, the lunchlady who was recently widowed when her husband died in Vietnam; Holling's sister; and Mai Thi, a Vietnamese girl in Holling's class who was brought out of her war-torn country by a Catholic relief society. I loved watching the relationships develop as well. Basically, this book gets the message through of what it means to be family, what it means to love, and how you can't judge a person by who you think they are before getting to know them. This Newbery-honor book is a delight, and I very much recommend it. I am looking forward to reading its companion novel, Okay For Now, which also won a Newbery honor. Disclosure: I bought this e-book on my nook. I really loved this book although I did prefer Okay For Now, which was amazing (I didn't realize they were companions when I read them). OFN was one of my favorite reads from last year and I think it is fully deserving of all honors it receives. I loved this book and didn't realize it had a companion. Thanks for the tip! LOVED this...and Okay for Now...two amazing novels. This sounds like a really excellent book for touching on many issues: war, family, religion etc. I agree with your preferences for historical (thought, I must admit, 1960s is too recent for me to consider history ;) ) books. Good review. thanks! This book has been on my TBR for ages! The snarky narrator and the character development sound fantastic. Wrap that up in a historical fiction that's realistic and I am in luuuuuurve. This one sounds like a great read, and I do love a 60s setting! Thanks for the thoughtful review. It just looks a little different, something unique, I suppose. Okay For Now is a wonderful book! 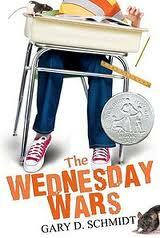 I haven't read Wednesday Wars yet, but I'm adding it to my list. This is actually sounds really good! Honestly, I hadn't heard of it before, but now that I have, you can bet I'm going to be checking it out! I really need to read this one, especially since I accidently read the sequel "Okay for now" recently. I just need to make a quick stop at the library in the near future!